I first made and fell in love with this corn bread two summers ago when I was diligently working my way through Peter Reinhart’s book for The Bread Baker’s Apprentice Challenge. It was a fantastic bread – rich and sweet and moist with sweet corn bursts and bits of salty bacon. The texture was unlike any corn bread I had ever experienced, thanks to Mr. Reinhart’s method of soaking coarse ground cornmeal in buttermilk overnight before making the bread. Yes, it takes a bit of planning, but it’s worth it. When I realized that our Summer Fest group would be talking about corn this week, I decided to revisit this bread. I haven’t been eating much bread or corn lately due to my self-imposed dietary restrictions, but I really wanted to make this for a special someone in my life who loves corn bread and hadn’t tasted this delicious version. Since I’m trying my best to remove highly refined flours and sugars from my diet, I changed the original recipe a bit and substituted whole wheat pastry flour for unbleached all purpose and used organic whole cane sugar in place of the white and brown sugars. The recipe turned out just as delicious with my changes, but feel free to use whatever flour or sugar you prefer. Although you can use frozen corn kernels, I highly recommend you use the freshest sweet corn you can find and cut the kernels yourself. I used fresh-picked local sweet corn from the Fresno State Farm Market and the flavor and texture was just perfect. Looks amazing! I'll have to try making this for the kids. You do amazing things with food. You and Mr. Reinhard make a heck of a team! Oh gosh you had me at bacon...we both used bacon with our corn...GMTA! This looks SO delicious! And I'm eyeing that cucumber soup on your last post too! I didn't make the cucumber week! Aw! This looks so yummy. I have some corn meal left, going to try this for sure. Isn't it bad to leave the buttermilk out overnight? so far I couldn't bake a successful bread .. and this looks doable.. and i have iron skillet . This is going in my wish list.. i want to try this one for sure! This looks fantastically good! Can't wait to try the bacony goodness. Oh, wow. This looks so good. My dad lives on Fresno State corn in the summer. Sometimes he eats it for breakfast! I'll definitely have to make this for him. I've made this cornbread a couple of times, and it is indeed a delight. I personally find it a tad too sweet, but that's easily fixed. And as it is corn season here as well, I really feel like going out to buy a few ears and making this ASAP! Looks amazing, my husband might even try this! You really do have a way with words, I so badly want to taste this bread right now. This looks amazing! I'm making a shopping list right now! I absolutely love this variation of cornbread and will be making this within the next few days. Thanks so much for sharing this recipe. Sounds so good! Well. I just made cornbread but this one with bacon totally upstages mine! The recipe looks delicious. I love your substitutions. I've been trying to do the same in my cooking and baking. Yum! Definitely going to try this recipe soon. I love a good cornbread, whether it's sweet or savory. 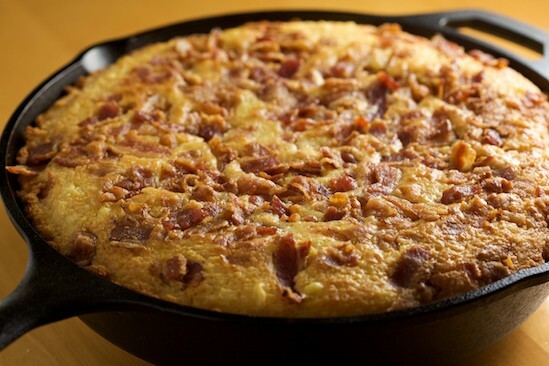 Wow, what a wonderful idea to incorporate bacon with cornbread! I've got to try that next time I make mine. Thanks for sharing and inspiring me with something new. Your cornbread looks just mouthwatering! Cornbread is something new that I am trying these days. I have always loved how the idea of it sounds like warm summer days on the veranda and smelling honeysuckle and lilacs on the wind. Its a bit corny I know, but I love it. I am in the process of trying to find a good formula for a gluten free version, due to the fact that one of my roommates is gluten intolerant. Love seeing you back to the Peter Reinhart game! I want to pick up the BBA again this fall/winter. I was halfway through and I feel like I left it so unfinished!Would have loved to participate in the summer challenges. How do I get involved? It's hard for me not to like anything with bacon but this sounds especially swoon-worthy! Bacon! Sounds and looks delicious. Thanks so much for linking to my recipe. I’m a huge fan of Aleppo pepper (and also urfa biber, which is similar), but not such a huge fan of yellow squash. Made this today with Polenta and just regular 2% milk and it was great! Took maybe 5 more minutes to set in the middle, maybe because of the thinner milk? Used a large cast iron, as well. Thank you! It's a keeper!